Last Saturday was the Western North Carolina Fiber / Handweavers Guild's annual retreat. I signed up for Sheila Church's workshop on knitting with silk hankies. If you've read my blog for awhile, you may recall that about a year and a half ago, I participated in a silk spinning workshop via the Online Guild of Weavers, Spinners, and Dyers. There were silk hankies in the silk goody pack I ordered for it, but I have to admit that I haven't done anything with them yet. What I have been interested in however, is learning how to knit from these hankies without spinning them. This workshop taught us how to do that. The project we created was a clever little treasure bag. Mine is pictured on the left. 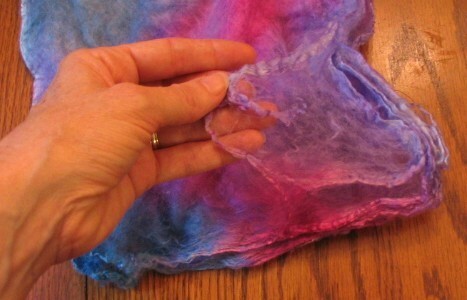 Silk hankies are made from silk cocoons. There is an excellent explanation with photos of this on Wormspit.com. Actually working with the hankies was similar to working with silk caps. They come in layers. Usually they are undyed, but our workshop kits came with dyed silk hankies in a choice of colors. ..... and stretched until it is the desired thickness. Since the silk fibers are so long, it is easier to attenuate it to the desired knitting size. Of course it could also be spun at this point. 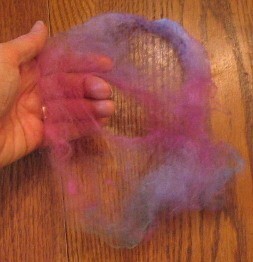 We learned to add a little twist while casting on, but after that we knitted the roving as is. Ah! I've spun silk hankies before (and have at token few tucked away) but I love that you can knit with them without spinning at all. How clever! Lizzie, yes, that's pretty much it. The trickiest part was casting on. I did a knitted cast on and as I mentioned, it helped to twist the fiber a little by hand before casting on the stitches. The twist makes it easier to see the individual stitches. Otherwise, the silk fibers spread out over the needles close together and it's harder to identify the stitches. 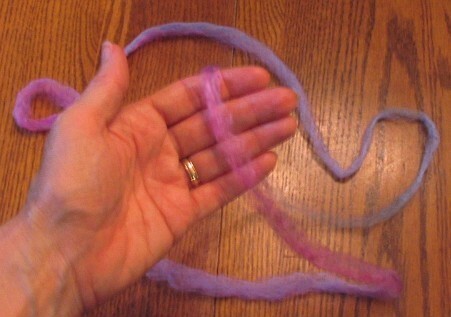 Since silk doesn't have any elasticity, it helped to cast on loosely. I had a little trouble doing this, so I cast on with a larger needle than I used for the knitting. You can use any knitting pattern you wish. Scarves from silk hankies are particularly lovely. We did a small project due to the time allowed for the workshop. Of course I'm a slow knitter, so I finished later at home. I really liked this way of using the hankies. It saved a lot of time but still looks nice Silk caps can be treated the same way. Wow. Who knew you could do this? Thank you so much. I have a batch of caps that I want to dye and didn't know what to do with. I've never used them before, so this would be a great project to play with. Thanks!!! Such a pretty bag, Leigh! (Well, I would say that, I make them too, although not from unspun hankies - yet.) A friend of mine has made scarves, too, it is a lovely technique. Wonderful! I love the look of the hankies but never really thought of what to do with them. Thanks so much for sharing! Well, that was a very cool tutorial, Leigh! It seems rather straight forward to do. I'll have to file that link away with my 'future projects'! Thanks! Bettina, I have to admit that I didn't count how many it took. The little bag weighs about 7 grams. Recommended needle size is US3 to 5. I agree that the hankies would not make an especially even yarn. I did find that with a little practice, I was able to draft the hankies out to get fairly even stitches with no slubby looking areas. This wasn't actually intentional, it's just what happened the more I worked with them. I have several of the white hankies that I bought at the Maryland Sheep & Wool and have never done anything with them. Now I know what to do. If I can get through some other projects, I will try the hankies. Thanks for some great information. What a great post! Thank you so much for showing, I think I´m going to try this :) In a few days my fist Hankies should arrive. 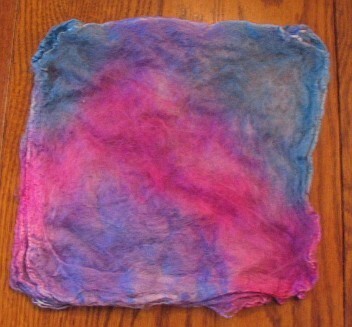 I recently took a spindle spinning workshop and tried spinning silk hankies. I am in love with them, but I need more. Can I purchase them online? Where do you get them (besides shows)? Vicki, silk hankies are wonderful, aren't they? Most stores that carry spinning supplies have them. Woodland Woolworks has undyed ones. Also Paradies Fibers. 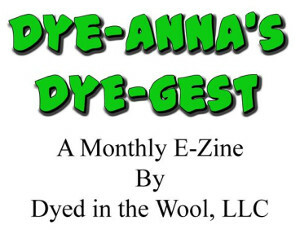 It's fun to dye our own! Hi Sue, I hadn't heard of Outback Fibers. Looks like a good resource. I join them similarly to yarn. The ends can be attenuated and overlapped; the ends can be needle woven in to the stitches. Of course, with a small project like this, joining usually isn't a problem.